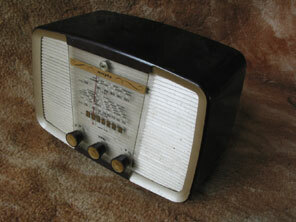 Also introduced was the A362 in bakelite, in a cabinet that returned as the A372 in 1957. The set features an unusual tuning scale with the moving cursor external to the cabinet. Although an eyecatching idea, a similar system had been seen on some Phillips receivers of the 1930’s with an even more striking method of mounting. 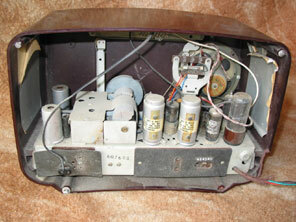 Unfortunately, unlike the Phillips receivers the back of the scale is not easily accessible. This had the effect that over time the back of the tuning scale tended to become quite dirty as it was not within the cabinet, and hence liable to splashes from the kitchen etc. Further details of this set may be found on the Murphy 1957 page, the valve line-up for the A362 was UCC85, 10C1, 10F9, EABC80, 10P14, U404 and the set is pictured above.